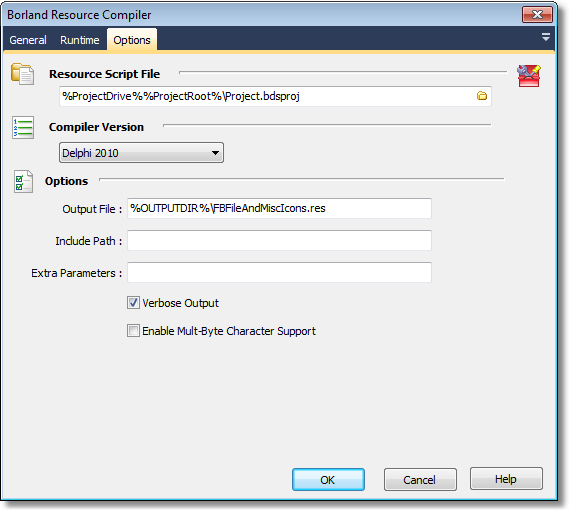 This action provides an easy to use interface for the Embarcadero Resource Compiler. Resource Script : The .rc file that you wish to compile. Output File : The path to the Output .res File. Compiler Version : The Embarcadero Resource compiler is provided as part of Delphi And C++Builder. This option allows you to choose which version of dcc32 to use. Verbose Output : Tells the resource compile to report its compile status for each line. Otherwise, it will only report errors.